The first time I saw the Creative Makers of the Pennsylvania Wilds Exhibit was at the Pennsylvania Lumber Museum. I was excited to see the show in person; I meant to look into booking it at the Gmeiner Art & Cultural Center for some time. After seeing the show, I immediately set out on setting the dates for it to come to the Pine Creek Valley & PA Grand Canyon landscape of the PA Wilds. The Creative Makers of the Pennsylvania Wilds is a traveling public art show designed to raise awareness of our rural region’s artisans and producers. Many of these talented professionals create their treasures from their homes, tucked out of sight. This show changes that. 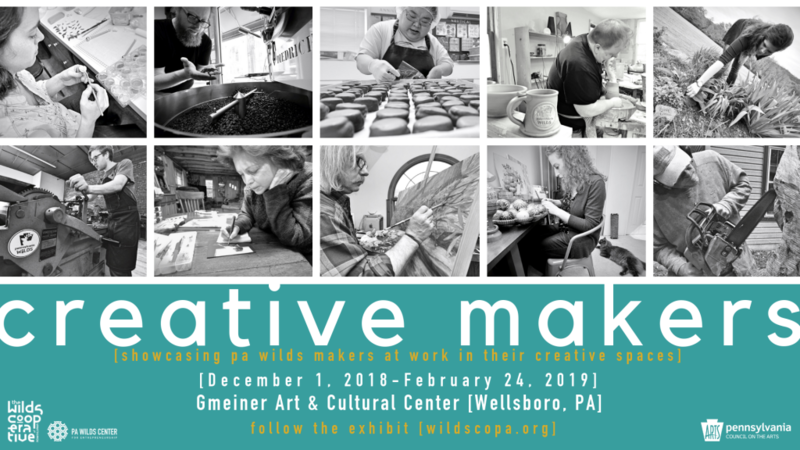 Dozens of creative makers involved in the Wilds Cooperative of Pennsylvania have been photographed and the traveling exhibit now includes over 200 images of these artisans working on their wares. Some are painting or drawing, while others are spinning yarn, making jewelry, crafting hand-turned pens, or pouring soap mixtures ready to cure; the list goes on! I decided December would be a good time to display Creative Makers Exhibit. The Gmeiner Art & Cultural Center is located in Wellsboro, and each year the community offers its traditional Dickens of a Christmas Celebration (this year, December 1). Dickens of a Christmas is one of the most popular town-wide events that we host. Busloads of people visit our little town to see musicians and street performers in Victorian costumes. Artisans line the streets peddling their wares. It’s a whole thing. While the Gmeiner is two blocks away from the action, we get a lot of visitors. This year those visitors will be treated first to the Creative Makers Exhibit in the Atrium Gallery. Simultaneously, in the Main Gallery, visitors will see our Juried Regional Exhibit. And in the Studio, we will host a Holiday Market of knitwear and locally-sourced wool by Glennfiddich Farms. 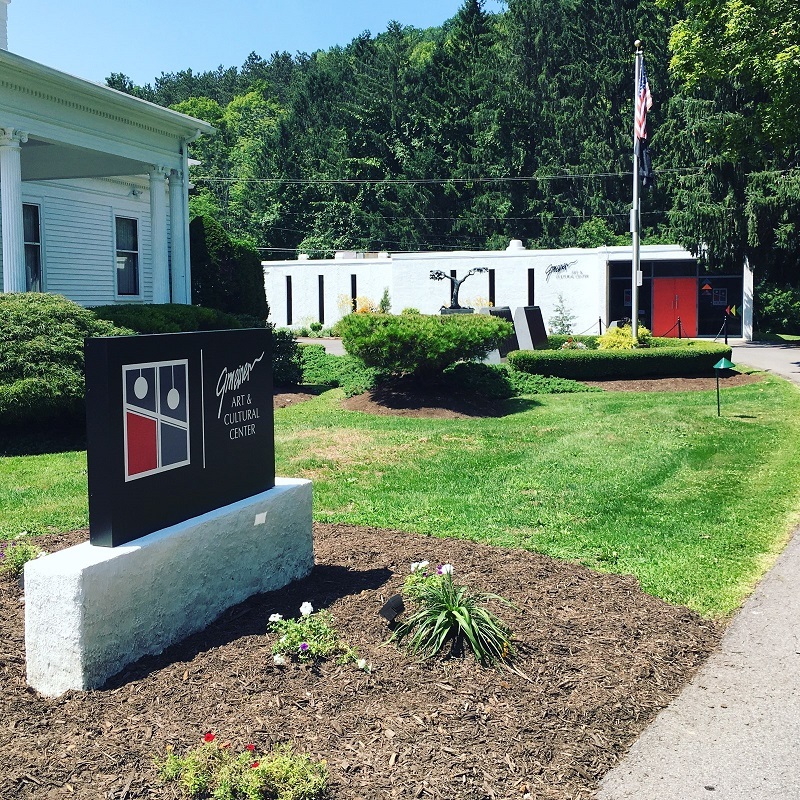 The Creative Makers Exhibit drives home the theme of regional art at the Gmeiner during Dickens of a Christmas and I couldn’t be more excited to help usher it to Wellsboro! The exhibit will be on display at Gmeiner Art & Cultural Center – located at 134 Main St., Wellsboro – from December 1, 2018, through February 24, 2019. During exhibits, Gmeiner is open 2-5 p.m. Wednesday through Friday and 11 a.m. to 5 p.m. Saturday and Sunday. For more information about Gmeiner Art & Cultural Center, visit www.gmeinerartscenter.com/. Details about the Creative Makers Exhibit, artisans featured, and images for sale can be found at www.wildscopa.org/creative-makers. About the author: Anna Wales is the Director of the Gmeiner Art & Cultural Center where she has been immersed in regional art since 2011. She lives in Wellsboro, PA, with her wife, 6-month-old son, and poodle.